Army Spc. 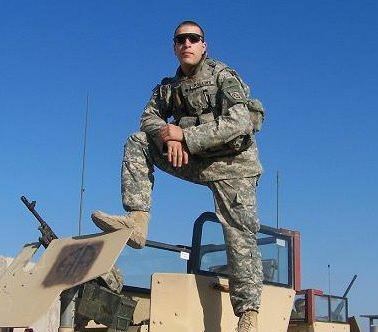 Justin A. Rollins - Run for the Fallen New Hampshire, Inc.
near his unit during combat operations in Samarra, Iraq. Justin was a 2003 Newport High School graduate. He played center on the football team and was a shot putter known for pushing himself and others with his high-energy attitude. 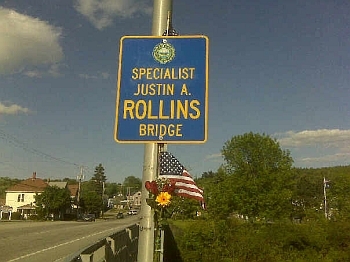 A slide show at his memorial service showed scenes from Justin’s life; days spent horsing around with his brother, Jonathan, deer-hunting trips with his family and one funny scene showing Justin in a tuxedo, after picking up his date for the senior prom in a golf cart. While everyone else rented limos and fancy cars for the prom, he showed up in a golf cart he had decked out. 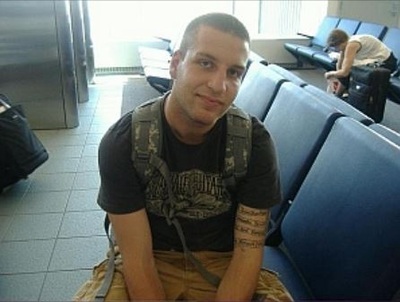 Justin decided to join the Army after the Sept. 11 terrorist attacks. He was an infantryman in the 82nd Airborne. Family and friends say the military transformed him from a joker and jock in high school to a mature, polished soldier who turned down a safe job as an Army recruiter to join his unit in combat. He wouldn’t have it any other way. 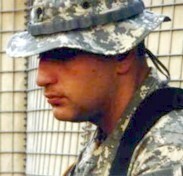 Justin approached his military service with the same high-energy drive he had put into his athletics. When his unit was sent south in the aftermath of Hurricane Katrina, he not only saved people, but also made sure their pets were rescued and cared for. Justin had recently been promoted to squad sniper, and despite being given a scope by the Army, had spent $600 of his own money so he could shoot farther and more accurately. 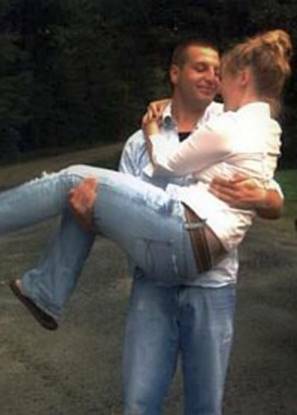 He was scheduled to come home in three weeks and with a diamond ring in hand, planned to propose to his long-time girlfriend Brittney Murray. The family remains close to Brittany. “We love Brittany like she was our own daughter,” father Skip Rollins said. Justin was a devoted Red Sox fan. Shortly before he was deployed, he had the opportunity to meet player David Ortiz before a game at Fenway Park. Justin hoped to see him hit a home run in that game, and Ortiz did. When Ortiz learned of Justin’s death, he said he remembered him well and promised to dedicate a home run to him. “He was such a good kid,” Ortiz posted on mlb.com. “He came to Fenway to watch a game and he wanted to meet me. It was going to be his last game at Fenway because he was going to Iraq. He came by the clubhouse and I talked to him for a while. He just seemed like he was so full of life.” Ortiz later hit a two-run, walk-off homer to win the June 24 game against the Phillies in the 10th inning. Ortiz sent two autographed balls and a signed jersey to his family. One ball, inscribed “To Justin Rollins, rest in peace. God bless, David Ortiz,” was buried with Justin at Arlington National Cemetery. Convinced that a family who lost their son fighting for the United States deserved their wish, Cmdr. Griffin Dalianis of Nashua promised to do what he could to get a puppy. “When you look into the face of a mother who has borne the brunt of this war with the loss of her child, you can’t say no to anything,” Dalianis said. (Cmdr. Dalianis, as the civilian aide for the Secretary of the Army in New Hampshire, is charged with the task of meeting the remains of soldiers at the closest airport. He has served as a civilian aide for the Secretary of the Army for 12 years. )Justin held and took photos with several of the puppies. But, Skip Rollins said, the fact that his family has the dog with which his son was photographed was just chance.” It just works out that she was in the pictures,” Rollins said. Skip credits Brittany for being the “driving force” behind bringing Hero to her new home. Brittany stayed in touch with Cmdr. Dalianis about getting one of the puppies from Iraq. He in turn, called the Secretary of the Army. Meanwhile, he advised the family to begin contacting their congressmen. 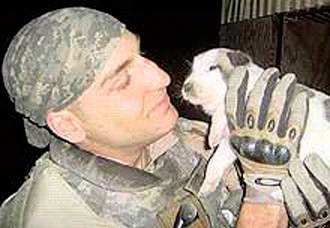 The soldiers who served with Justin had taken one of the puppies, but hadn’t received official permission to get the dog. After being reprimanded by their first sergeant for having the dog without permission, the soldiers had to let the dog go. 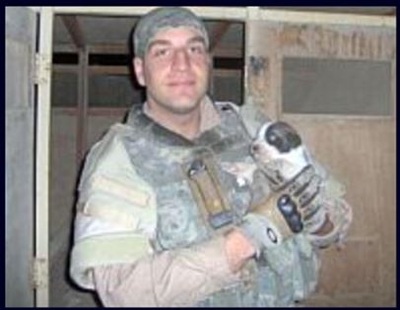 When the Rollins family received permission to bring the dog home, the soldiers went back to the litter. By then there were only a few puppies left. Justin's awards and decorations include the Army Service Ribbon, the Iraq Campaign Medal Ribbon, the Global War on Terrorism Service Medal Ribbon, the National Defense Medal Ribbon, the Army Overseas Service Ribbon, the Army Good Conduct Medal Ribbon, two Purple Heart Medal Ribbons and the Bronze Star with Valor. Justin is survived by his parents Rhonda and Mitchell 'Skip' Rollins, his brother Jonathan Rollins, girlfriend Brittany Murray and his extended family.